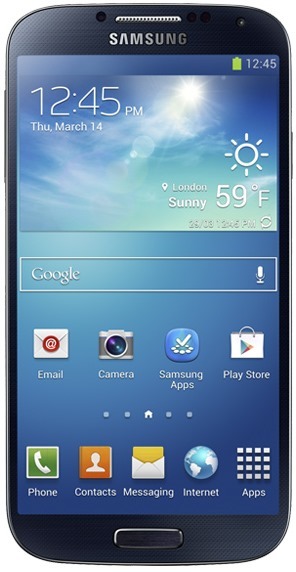 The launch of the Samsung Galaxy S4 is set to proceed from the end of this month, although specific details on when the handset would land on each carrier have remained largely undisclosed. Today, however, a leaked document originating from US retailer Staples appears to have revealed the exact release dates for the handset on three of the big four carriers, and although the dates are described as "tentative," they at least offer a ballpark timeframe for consumers to begin preparing to make the purchase. We already knew the T-Mobile version of the Galaxy S4 would be arriving around May 1st, as stated by the company’s CEO John Legere at the "UnCarrier" press conference late last month. T-Mo is looking to coax consumers away from other big-name carriers by offering more flexible deals, and with the iPhone 5 now also available in time for the company’s big 4G infrastructure launch, the carrier is certainly a viable option for prospective upgraders. AT&T is North America’s largest mobile carrier, and thus it should come as little surprise that the Samsung Galaxy S4 will arrive there first. From April 26th, consumers will be able to get their hands on the latest and greatest Samsung Galaxy S devices, and if you’d like register your interest by preordering, you’ll be able to do so at Staples from April 16th. 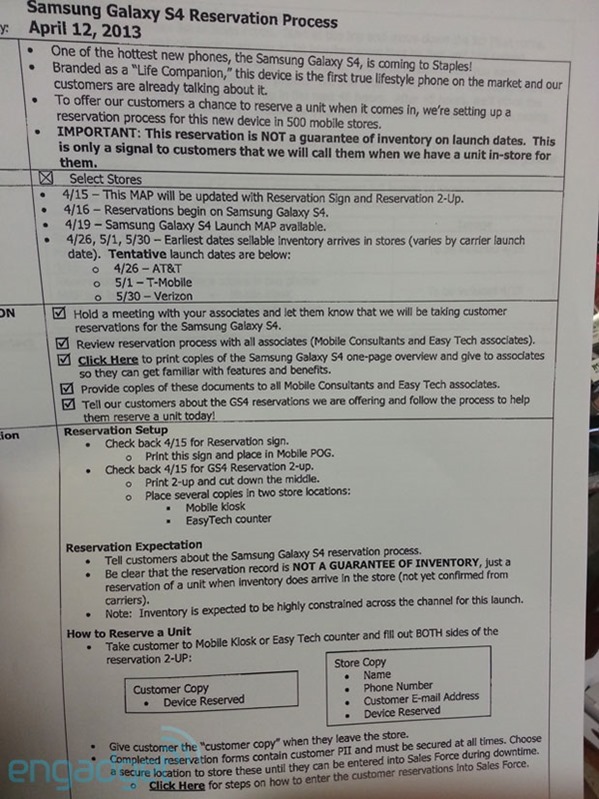 If you’re looking to grab the Galaxy S4 on Verizon, you’re going to be in for quite a bit of a wait. The device doesn’t arrive to the carrier until May 30th, which gives both AT&T and T-Mobile a clear advantage in raking in those early adopters. If the Galaxy S III’s launch, which saw millions sold in the first couple of weeks alone, is anything to go by, a large portion of those out to get the S4 will do so sooner rather than later. Even though no details on the price have been revealed, stores are going to be besieged with Android fans in the coming weeks, and with Staples also stipulating that its preorder system "is NOT a guarantee" of securing a device at launch, one suspects that the initial inventory will be quickly worn thin. To know more about Galaxy S4, check out our detailed post on all the specs, features and accessories announced for Galaxy S4 by Samsung. To uｎｌｏｃｋ a device is easy, but keeping it uｎｌｏｃｋedgot much harder because of unprofessional uｎｌｏｃｋ teams.there are thousands of bad examples whoom got relocked by at&t. You have to be sure that you buy uｎｌｏｃｋ from the uｎｌｏｃｋ team which had been the most professional uｎｌｏｃｋer since the beggining, like ATTIPHONEuｎｌｏｃｋING or my#imeiuｎｌｏｃｋ. For people using AT&T, if you want to սոⅼοсking AT&T devices and should not do it through AT&T, you are able to always go to just google atttiphooneuunlocking, oahu is the site I have now been using for ՍΝᏞΟᏟΚing my phones, also the best սոⅼοсking site I have ever use, we have the facility to ՍΝᏞΟᏟΚing the modern 6S and 6C as well.